Pancake Tuesday was last month and the good people at Clinton Street decided to celebrate that and Valentine’s day all month long in February and even extended it to a few days in March. Now, if you know us, you’ll know we are crazy about pancakes. Mrs. Kitchen makes made amazing pancakes and she has refused to make any more since our love affair with Clinton Street started. Trying out all the pancake flavors on offer for Pancake Month at Clinton Street would have made us broke, but we were able to catch 3 of the 11 different kinds on offer; we don’t know who comes up with these combinations but they all made our mouths water. We had the Japanese pumpkin pancakes, chocolate chunks and fresh raspberries (delivery) and coconut and key lime pancakes. If there ever was a grinch who stole Valentine’s, then it’s Mrs. Kitchen, but that didn’t stop us from taking part in the London Dairy and BBC Good Food Middle East Valentine’s cooking competition last weekend. We arrived at Fairmont, The Palm, Dubai nice and early and we were up against 3 other couples. Our task was to recreate a dessert made by Chef Romain Van Durmen which was a brownie, salted caramel, caramelized peanuts and tempered chocolate served with pralines and cream ice-cream from London Dairy, and we had to do this in 45 minutes!!! It was intense and those 45 minutes went by really quickly. We didn’t win, but we had tons of fun participating and we were thoroughly spoiled by BBC Good Food Middle East and London Dairy (Let’s know if you would like some ice-cream and we can send you some). Thanks BBC Good Food Middle East! We hope you enjoy the slide-show below. A couple of weeks ago, we posted pictures on Instagram from our afternoon tea experience at The Champagne and Tea Lounge, DUKES Dubai. Mr. K. described it as the best afternoon tea we have had in Dubai; I couldn’t agree more. Ambience: The ambience is okay; not as fancy as the typical afternoon or high tea rooms that we are used to, no harpist or pianist, I don’t even remember hearing any music 😦 . It was also devoid of huge floral displays which we absolutely love, à la Palm Court at The Langham in London or Al Bayt at Palace Downtown, Dubai. The china was also not fancy so I guess the understatement may be deliberate. The table was a tad small and cramped for 4 people but the food, tea and service made up for what was lacking in ambience. Food: The sandwiches were lovely and we had the usual smoked salmon and cream cheese, cucumber and also egg salad sandwiches. We got sandwich refills (trust me, this is a big deal as we’ve been to other afternoon teas where they don’t offer refills of even the tea). The scones were nice and warm and the texture was absolutely divine. We found some of the sweets a tad too sweet, the meringue especially. Other than that, everything was great. As it was during the Christmas holidays, mince pies were included as part of the offerings. We are typically not fans of mince pies but we became converts when we tasted theirs; the pastry was crisp and not heavy or chunky like shop-bought ones and the taste of the filling delicious and not overpowering. They have an amazing selection of teas and we absolutely loved the one called Celebration. We had the Happy Forest (which is a fruit infusion), the Lapsang Souchong and one with Saffron (I don’t remember the name). We got a complimentary birthday dessert as it was my sister’s birthday and we also had fun Christmas crackers on the table. Service: The service was 5 star. From the moment we called to make reservations, the staff were attentive and asked about allergies and if there was a celebration. They were knowledgeable on the teas, always had a smile and were very happy to offer us refills on the sandwiches, sweets and scones. Pricing: The London Afternoon Tea (no champagne) costs AED 170 per person. Psssst: they accept Entertainer, so you can get 2 for the price of 1. Scores: We give The Champagne and Tea Lounge a deserving 8.5 out of 10 (Mr. K. does the grading as always) and we highly recommend it. Location: The Champagne and Tea Lounge is located at DUKES Dubai, Palm Jumeirah, Dubai. As we also did not post on the blog at all in 2017, we feel we owe you a greeting for the past year as well. We hope you missed us as much as we missed blogging and you of course! A lot happened in the time that went by; we had Baby Kitchen 🙂 🙂 🙂 , we launched an Instagram page and we moved to Dubai (so expect some Dubai restaurant reviews in some of our posts). Some things didn’t change however; we still love to cook, eat and blog. We have great plans for this year and we hope you stick with us. Have a fantastic year ahead. Wishing you good health, love and happiness! Sometime last month, Mr. K and I had planned date night and I wanted it to be somewhere fancy with really good food. I wasn’t so fussed about Sky Lounge or Villa Medici so we thought to give Tarragon a try. I had seen Chef Tiyan (she runs the show over there) put stuff about it on Instagram and she had also sent out a text earlier that day mentioning that it was now open but I didn’t know anyone who had tried their food. We made reservations and got there a little after 8pm and we were greeted with complimentary glasses of champagne…they won my heart immediately. We also got complimentary shots of potato and leek soup which was absolutely delicious. The decor was simple and unpretentious and we only saw 2 waitstaff through out the night which for me was fantastic. I hate to go to places and feel outnumbered by waitstaff who are either gisting or staring and making you feel uncomfortable. The 2 waitstaff effectively managed 4 tables while we there and one of those tables had about 6 people. Mr. K had the Butternut squash soup for starters and I had the Chicken (minced chicken, honey, sesame seeds and chives). Of course, I had some of his soup and it was soooo good. My chicken came late and slightly undercooked; I sent it back and Chef Tiyan couldn’t believe a plate came back to her kitchen. She asked the waitstaff to make up for it with bottomless free champagne and my chicken came back nice and well cooked. We were also served some really nice olive bread and milk bread. For our mains, I had the Atlantic Pompano (served with potato 2 ways: mash and the other one was like a crisp) and Mr. K had the Lobster. The mains were very good but I found the potato crisp thing a little too crisp, I couldn’t cut through it and I had to pick it up with my fingers to eat it. Dessert…Dear Lord God!!! It was amazing. Mr. K and I shared the Tarragon trio (and only because the waitstaff talked us into it). We don’t normally order dessert at restaurants; we would typically finish dinner and then find an ice-cream or frozen yoghurt place or go have tea with cake at home. The Tarragon trio was a cheesecake, apple tartlet and creme brulee; Mr. K doesn’t like custard but he licked the creme brulee clean. They all came together nicely and was a good end to a lovely meal. Damage for a 2 and a half course meal for 2 people was about N45,000 excluding liquor, as we enjoyed free champagne. Oh, I had an apple spritzer…very refreshing and delicious by the way. It’s pretty pricey at Tarragon but I wasn’t upset at the bill because the food was great, the ambience was great too and so were the waitstaff. I think it’s worth the money and if Nigeria was a Michelin star region, Tarragon deserves at least 2 stars. We give Tarragon a 9.25 out of 10 (Mr. K did the grading, I don’t know what the .25 is about). Tarragon is located at 50, Raymond Njoku street, off Awolowo road, Ikoyi. We have no excuses for disappearing. Work got a little hectic for Mr. K and I and we just kept procrastinating the posts but we’re still here. Sometime during all these weeks of silence, Mr. K and I went on a protein diet for a week – no salt, no sugar, no veggies, no carbs, no nuts, no fruits…in short, no life. It was the toughest thing to do (especially the first few days and because we were also working out) but we needed the crash diet. I lost 2.5kgs and Mr. K lost about 4kgs. I’ll put up a post and eating plan on that soon but I don’t advice it, unless you’re trying to fit into a dress at the weekend. We also had the wonderful Aghatise’s over for dinner some weekends back. Happy Wedding Anniversary Guys!!! Their 3rd wedding anniversary was yesterday. “Come Dine With Us” post also coming up before the end of the week. We’ll leave you with our latest breakfast crush for now, before we put up all the other posts. It’s the breadless burger and it’s oh-so amazing. Trust me, you won’t miss the bread (that much). Rinse all veggies and soak in vinegar for a few minutes. Grill the pattie. If you have the energy to start a bbq fire, please, by all means. I use either a halogen cooker or a grill pan. Fry the egg(s). My preference for this is sunny side up eggs, but you can skip the eggs if you like. Now it’s time to assemble the burger however you like but be sure to use the cabbage as the “bun”. It is really quick, simple and very enjoyable. I found the light cheese at Spar supermarket (Lekki) but I’m sure they have them everywhere. Mr. K looked it up for me and each slice is just 38 calories. See more info below. I woke up on Saturday morning craving spicy food. 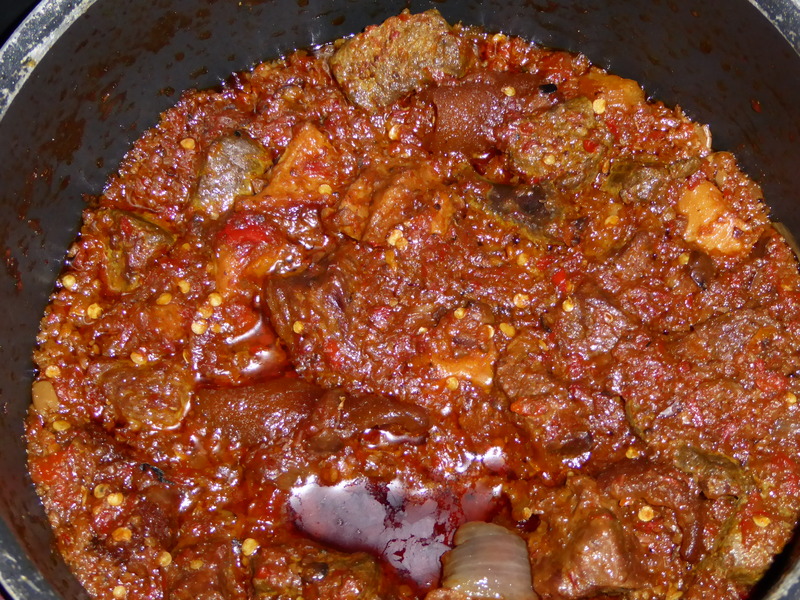 The craving was so bad that I put all my “issues with market” aside and hit the road to get “orisirisi”meat to make ofada sauce. 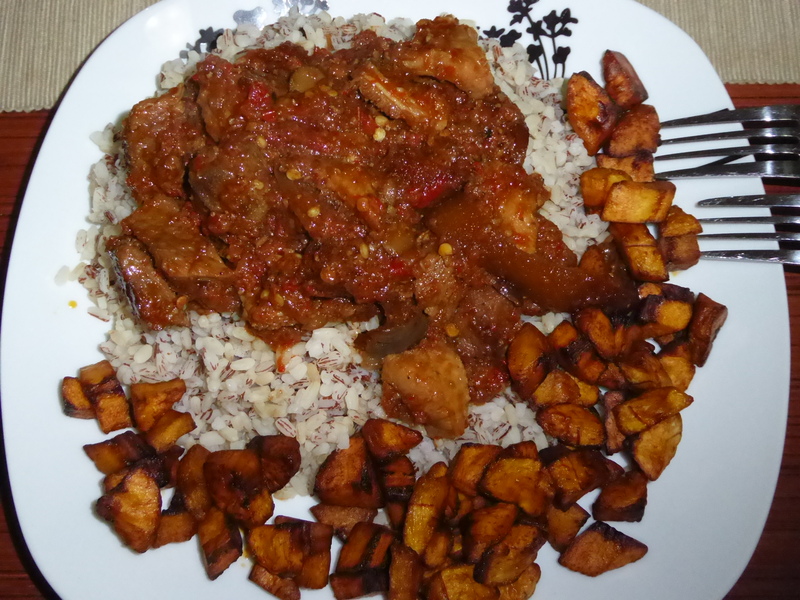 We had ofada rice and sauce for lunch on Saturday. Yes…2 forks, we ate together. On Sunday, we had rice again 😦 but if it’s any excuse, we had it as a side. 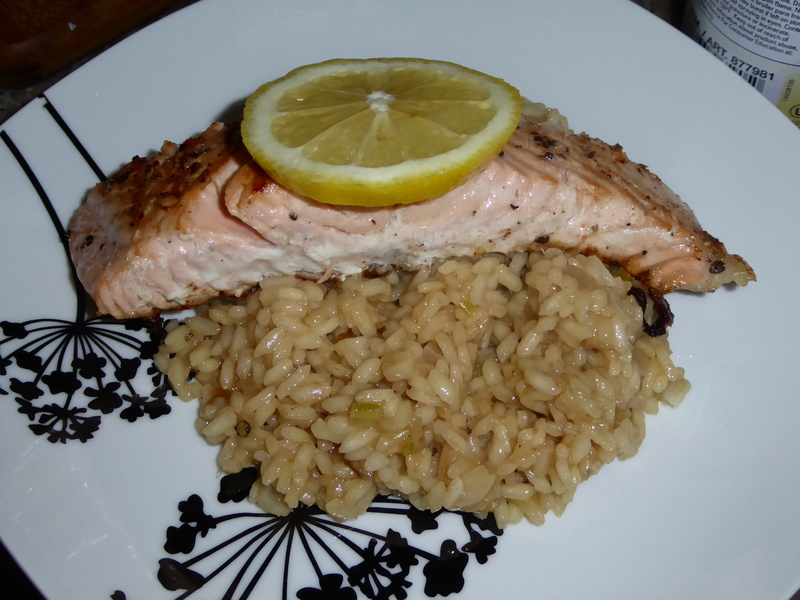 Mr. K and I made risotto with pan seared salmon. The risotto was a basic one and the entire meal was no-fuss but yet sooo delicious; we didn’t need any thing else but the ingredients in the picture above. 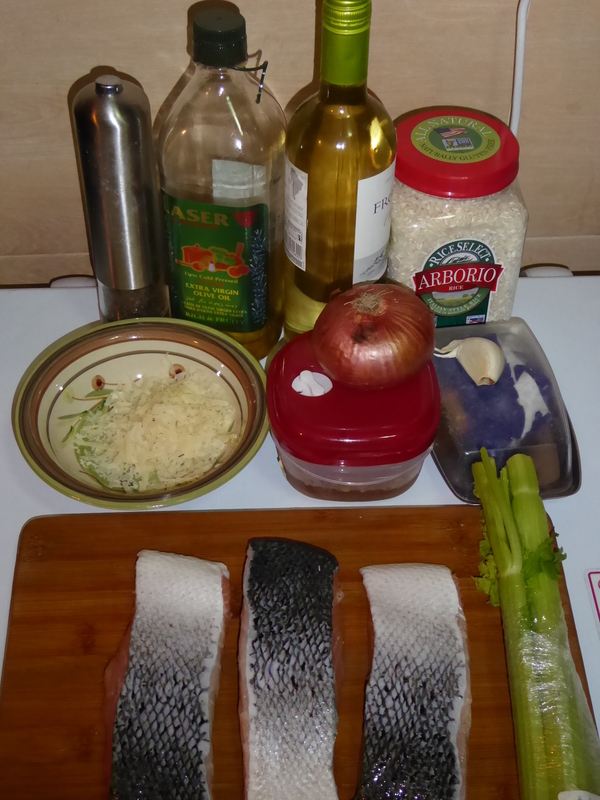 Mr. K will write a post on cooking an amazing basic risotto soon. Mrs. K on Look Momma, I Made It!!! Nedoux on Look Momma, I Made It!! !